In Defense of Communism: Greek soldiers: “Our only enemy is NATO”! 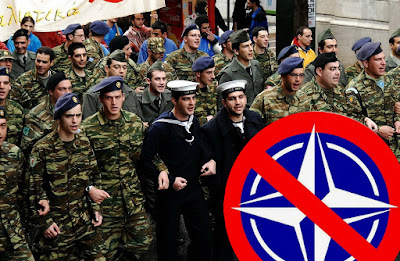 Young Greeks who perform their military service in army camps at the region of Evros, in north eastern Greece, have expressed their firm opposition to the installation of a new NATO base in the port of Alexandroupolis. 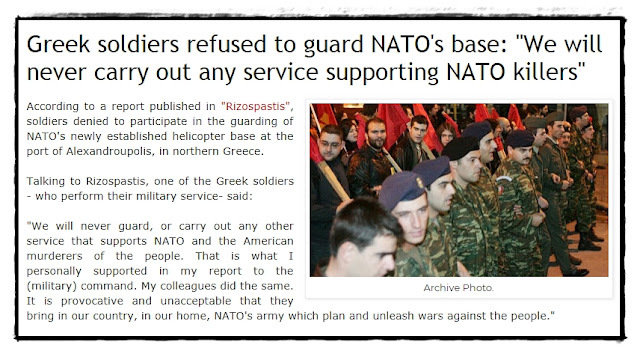 According to letters published at 902.gr portal, soldiers express their anti-imperialist sentiments, as well as their willingness to participate in the, organized by local peace committees, anti-NATO demonstration which is scheduled to take place on Sunday 11 February in the city of Alexandroupolis. “We understand that the only enemy for us, for the Greek people and the working class is NATO. Its them who intervene, slaughtering the people for the benefit of the capitalists and their profits” writes a letter by soldiers of an infantry battalion based in Alexandroupolis. “We have denied to support the operation of the port as a (military base). From the very first time, we are by the side of the working people, the youth who demonstrate against the installation of the base”, the soldiers write and underline: “NATO killers, get out!”. Another group of soldiers from a camp in Orestiada, close to the Greek-Turkish borders, write: “They want to use the port of Alexandroupolis, like it is happening with the NATO base in Souda, Crete, as a homebase for imperialist interventions which result in new tribulations for the people of our broader region”. Local peace committees from Eastern Macedonia and Thrace organize a demonstration against the installation of NATO's base in Alexandroupolis' port, on Sunday 11 February, 11am local hour in front of the city hall. Speeches will be delivered by Christos Trellis, member of the national council of the Greek Committee for International Detente and Peace (EEDYE) and retired lieutenant colonel Nikos Papanastasis, also member of EEDYE.